The Minicom 0VS21007 is a UTP Video Splitter Remote Unit with Audio that broadcasts up to 360ft. 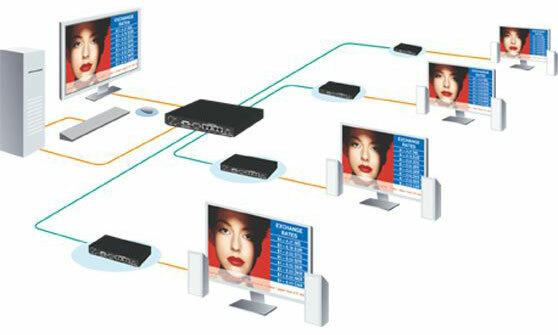 The 0VS21007 is part of the Minicom AV broadcast solutions. The CAT5 UTP VGA Splitter simultaneously broadcasts, in real-time, video images to multiple remote screens. Using advanced CAT5 cable technology video images can be broadcast to distances of up to 250m/820ft. Cascaded it can broadcast to dozens of screens simultaneously. The CAT5 VGA Splitter is the best solution for places where there is a need for sharing of information, in real-time, at multiple locations. For example: corporate showrooms, banks/stock exchanges, trade shows, training centers, train/bus stations and airports.